Between birth and adulthood, there are only around 17 to 18 summers that you have to experience exclusively with your children. Of those, there is only a mere handful of warm, memory-soaked, fun, summer days that you get to share with your teenager before they spread their wings and venture out into the world as an independent adult. While you will be beaming, proud, and undoubtedly a tinge sad when that day arrives, you should strive to make the most of each summer you have with your teen. Likewise, while you are robed in nostalgia and savoring each moment, your teen may get very bored and restless midway through the summer. At this point, they will start to rely on you for some entertainment and ideas of things to do when boredom strikes. The great news is that you can meet both your teen’s needs and yours at once by planning fun, interactive activities that will alleviate boredom and provide you opportunities to connect with your teen and enjoy their company before school starts up once again. Institute a weekly pizza night, and have your teen help plan the ingredients for a new concoction each week that you prepare and cook together. Camp out in your backyard, and admire the stars and moon. Pack a picnic, and spend the afternoon at the park playing barefoot in the grass. Ask your teen for input and help in planning your next family vacation. Have your teen help you give your Facebook page a summer makeover. Read the same book, and then discuss it over dinner once a week until you’ve both finished reading. Wake up early to watch the sunrise together. Volunteer together at your local library by reading to children. Grow some fresh herbs and use them in your favorite dishes or to make a body scrub. Embrace a bit of fun and whimsy and tie dye a pair of sheets for your teen’s bed. Make a music video together to your teen’s favorite song. Help your teen update or renovate something in their bedroom. 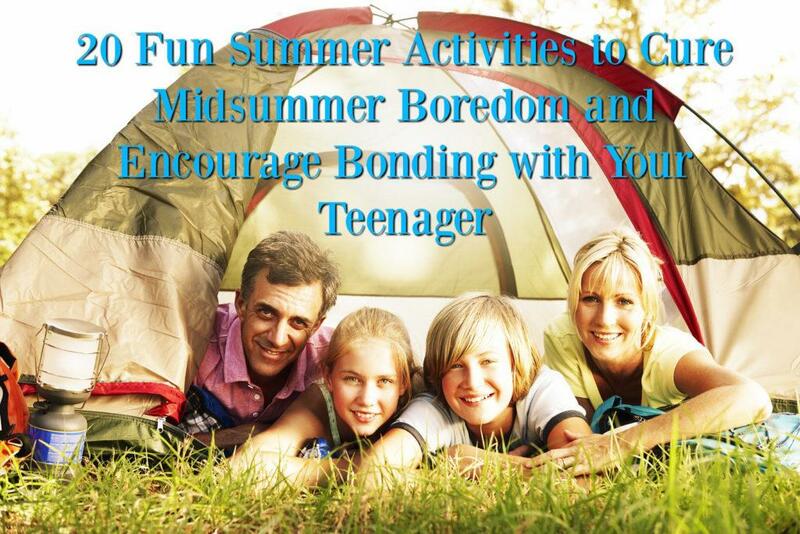 Pick a fun summery activity your teen enjoys, and have them teach you how to do it. Have a sleepover movie night, and let your teen pick all their favorite movies to share with you from a cozy blanket fort filled with snacks and drinks. Hold a paper airplane flying competition with your teen. Decorate a journal together, and encourage your teen to write in it once a day, for a week. Start random dance parties at unexpected times. Pick a charity you both believe in, and come up with creative ways to raise money to donate. Hold an all-day scavenger hunt with post-it note clues that guide your teen to the next adventure of the day. If you struggle to connect with your teen despite planning some of these fun, boredom-curing activities or notice that your teen is exhibiting a growing lack of interest in their family or friends, it is a good idea to consult a professional teen counseling service. A teen counselor can help you connect with your teen. and ensure they are mentally healthy and give you more ideas of how to enjoy time together as your teen grows.